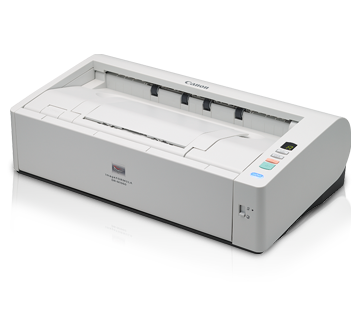 The DR-M1060 document scanner is built to handle high-speed scanning with U-turn and straight paper path. Despite its compact desktop-scanner size, the DR-M1060 is capable of scanning A3 documents. Its unique U-turn path design allows documents to be fed and ejected from the front of the scanner for convenient and efﬁcient scanning operations. The U-turn path can be switched to a straight path for plastic cards, thick paper, and other types of documents that cannot be bent, expanding the variety of media that can be scanned. The DR-M1060 is extremely productive with ultra-fast duplex scanning speeds up to 120ipm (A4R) and a 60-sheet document feeder. Despite its small size, it is built to handle big workloads of up to 7,500 documents a day. Perfect your scans with image processing functions. The background smoothing function can reduce unevenness and smoothes your scanned image. The Automatic Colour Detection allows the scanner to automatically determine which documents be saved in color or grayscale, based on detected color content with threshold value. This means you don’t have to separate black-and-white and color documents prior to scanning, and image file sizes are kept smaller than scanning the whole batch in color mode.